Here’s this week’s dispatch from the crossroads of faith and culture. The wisdom of silence. This interview with author Greg Willits hit my inbox this morning. In it the the former co-host (with his wife Jennifer) of the SiriusXM talk show The Catholics Next Door offers advice for those who, for whatever reason, find themselves caught up and sometimes immobilized by knots of anxiety. QUESTION: You share some personal details about how you have been tied in knots in your life. How did you get the idea to share your story and practical advice in Tied in Knots? GREG WILLITS: My wife and I have long had a devotion to our Blessed Mother, who was the direct inspiration for the Rosary Army apostolate we’ve been running since 2003, as well as other websites like NewEvangelizers.com and TotalConsecration.com. But it was in 2015 when my wife challenged me to paint my own version of Mary Undoer of Knots, which we then hung in our bedroom, that our devotion to our Lady under this title flourished. A few months later, when I was rather stressed out due to multiple factors, I was asked to lead both a parish staff retreat as well as 3-night mission at another parish. As I prepared the talks for both of these events, I kept getting drawn back to the idea of how so many of us are stressed out and unhappy in the world, and how that seems so counter to the joyful and peaceful lives we’re called to live as disciples of Jesus Christ. Though I initially intended to give a series of talks about a completely different topic, I couldn’t escape the undeniable pull to share times from my own life when I’ve been entangled with anxiety and twisted with trepidation so as to provide illustrations of how – time and again – Jesus and his mother were constantly present to either untangle those knots, or to reveal to me how the knots in my life may actually be a blessing waiting to happen. QUESTION: There is so much noise, confusion and anxiety in the world, be it world events, a barrage of negative news on the TV and yet, peace can begin with us individually. How have you found that peace amid all the noise and things that cause anxiety? GW: My BOSE sound-cancelling headphones certainly help! But seriously, we often invite the barrage into our lives through constant notifications on our phones and an addiction to binge-watching and news consumption. In many cases, it is our addiction to technology that makes it harder to escape all the noise. Having said that, I love technology and my house is full of gadgets. But I call the shots and choose how *I* will use the technology, and not how the technology will use me. If negative news stresses you out, fast from it for a day and see if you feel better. If you feel an endless pull to always respond to email, set an auto-responder for a few days letting people know you’re taking a break from email. Delete social media apps from your phone and only check them from your computer. Set timers every time you sit down to surf the net. Take action to be in control of what you allow in your brain. This is the attitude of self-mastery, and we’re called to this in all areas of our lives and not just technology. We’re called to master our emotions so that we don’t lash out at others. We’re called to master our passions so that we don’t fall into sin. We’re called to be disciples of Jesus Christ, not disciples of this world. QUESTION: What are some of the practical ways that people can begin to become untied from the “knots” in their lives? GW: I’m tempted to say, “Buy the book and read chapter two!” But that would be the easy way out. The truth is that there is no single silver bullet to find peace and to be rid of anxiety. But there are quick ways to seek relief – whether it be as simple as going for a brisk walk or skipping junk food for a day (you’d be surprised how much our diet affects how we see through troubling times). To that point, one of the quick-fix emergency room solutions I suggest in the book actually has roots in 12-step recovery programs that use the acronym H.A.L.T., which stands for Hungry, Angry, Lonely, Tired. These four conditions alone can cause significant anxiety. When combined with genuine stressful situations, they can make matters even worse. If you’re hungry, eat something healthy and filling instead of a bowl of ice cream. If you’re angry, read Philippians 4:4-7 and take the challenge of thanking God for your current difficulty and be assured that in doing so that the peace of God will keep your heart and mind in Christ Jesus. If you’re lonely, get off of social media and go somewhere where people actually are. Go to the gym, the library, or spend time with Jesus in the Blessed Sacrament at your local parish. If you’re tired, go take a power nap. Take care of the easy problems so you’re more mindful and ready to tackle the bigger ones. QUESTION: There is a rare title of the Mother of God as Mary, Undoer of Knots that is becoming more widely known since Pope Francis began promoting devotion to Our Lady Under this particular title. Her feast day is today, September 28th…could you describe this devotion and how she has helped you? How she can help others? GW: In the book I describe how each of us has a “ribbon of life.” Like the historical timelines we used to draw in school to illustrate world history, each of us could draw a timeline of important events in our lives. Sometimes those events are joyful ones. Other events may be the source of ongoing agony and pain, such as abuse, betrayal, and abandonment. Those negative events in our lives could be seen as knots in the ribbon of our lives. These knots muddle the way we look at the world, how we interact with other people, and even how we see ourselves. All of these things – and more – can keep us bound up and unable to experience the freedom God desires for each of us. And this freedom is absolutely necessary if we are to also experience the peace that can only be provided by God. Because Mary continually points us back to her son and our savior, she wants to take the ribbon of our lives into her own hands and undo those knots of pain and sadness so that we may once again have a smooth ribbon of life free of burdens and turn our gaze back to Jesus. For me, the greatest lesson that has come from sometimes being tied in knots is that it is often from the difficulties of life that Jesus brings the greatest joys. The adage of “hindsight is 20/20” is so true, and I challenge people to look at past difficulties and to acknowledge how often God has brought blessings from pain. Mary, Undoer of Knots, wants us to ask, “What blessing could come from the current knots in our lives?” And then turn that knot over to her. It’s difficult to do. Surrendering always is. But every time I’ve abandoned myself to Mary, Undoer of Knots, while in the midst of pain, she always turns my gaze back to Christ, and from him I always experience peace once again. QUESTION: You are really bold in your testimony to share personal examples of perceived failures or set backs to show God’s plan and glory in your life. Could you share some of the feedback you have received from people who have read your story and reactions? GW: My wife and I have been podcasting or doing radio since 2005 and the number one lesson we’ve learned is that people are more greatly affected by testimonies of weakness rather than being preached at with seemingly unrealistic expectations. Whenever we’ve gone through a painful experience and shared it on our show – whether it be miscarriage, unemployment, death in the family, or serious illness (all of which we’ve shared over the years) – we’ve learned that someone else out there listening has most likely gone through the same thing. And in hearing someone say, “It hurt when that happened,” often lets someone honestly acknowledge their own pain for the first time. Having heard from thousands of listeners over the years, I know that so many people are walking around with knots. Having dragged my own knots behind me for so much of my life, I don’t want others to experience the same life of pain. That’s why in both our podcast as well as in Tied in Knots, I have faith that someone will be helped just by knowing someone else can understand their pain. So far, from the reviews on Amazon and from countless emails I’ve received, that comfort is the main thing people are finding with Tied in Knots. You’re not alone. Those knots can be undone. And even if you’re called to live with that knot for quite some time, you can experience peace in the midst of the knot. 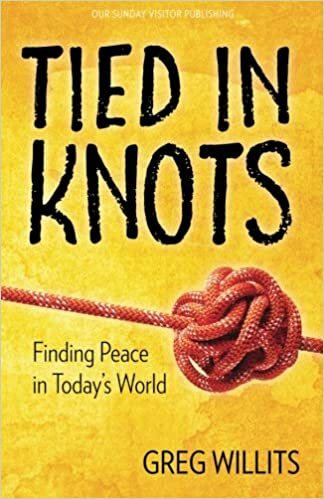 QUESTION: Tied in Knots is a powerful book for all people, not just the faithful…is there anyone that you would like to read your book in particular? GW: Whenever I write a book or produce some other kind of media I always try to imagine the audience that will pick it up. Though Mary, Undoer of Knots, has a prevalent place in the book, I wanted this to be book that will help everyone at any stage of faith development. That’s why it was so important to me to include not just prayerful and spiritual solutions, but also tangible “quick-fix” solutions for many of the daily trials that everyone experiences. This includes your fallen away family, or your co-worker in the next cube who has had a bad week. I wanted this book to be realistic, hopeful, and invitational to those who may not know – or believe — just how much God loves them. QUESTION: Will there be a follow up to Tied in Knots? GW: It’s impossible for me to not be working on the next project. While I can’t say if it’ll be a direct follow up to Tied in Knots, I can definitely say that my wife and I will continue producing our Adventures in Imperfect Living podcast at www.gregandjennifer.com where we chronicle other ways that Jesus and Mary can take our imperfections and knots and turn them into amazing blessings.